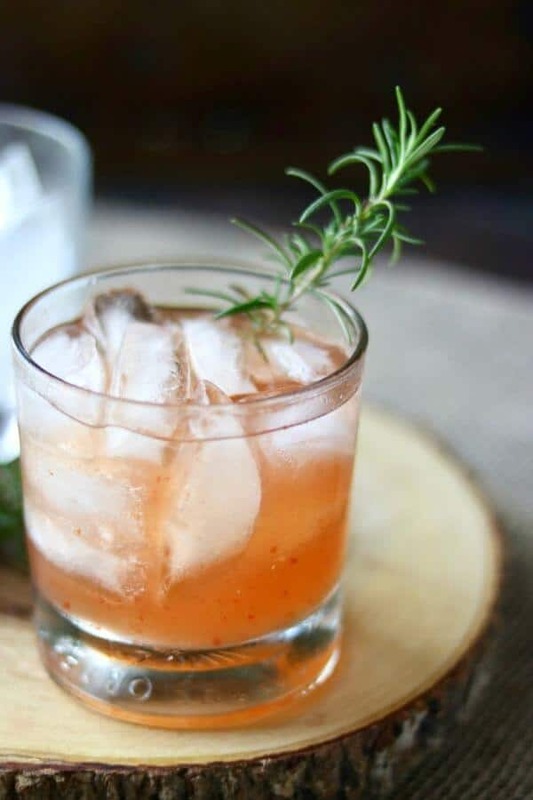 Spicy and sweet, this tequila cocktail is my take on the classic Tequila Sour cocktail. The sweet peach flavor is balanced with a tart blast of lime and finishes with a fiery kick of sweet-hot jalapeno. You can add club soda to make it lighter if you want to. Either way, it’s the perfect, unique addition to any Cinco de Mayo celebration. 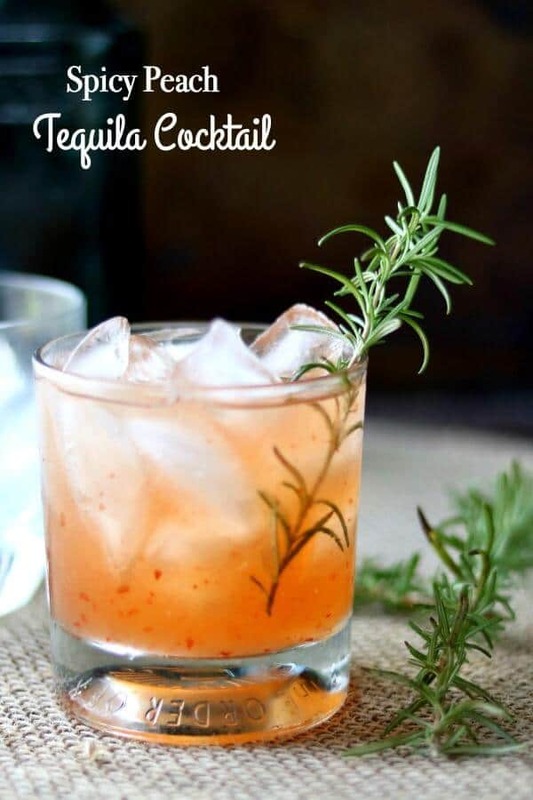 When most people think of a tequila cocktail they think of a margarita in all of its vast array of flavors and forms. 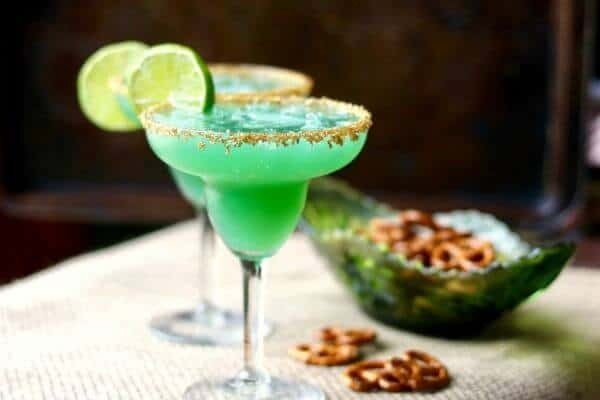 There’s no doubt that in the United States, and especially in Texas, the margarita is the most popular tequila drink. And it really is delcious – it’s on of my favorites. But there’s SO much more to tequila than just a margarita! That’s like only making chocolate cake and never trying any of the billion other ways to have chocolate. Over the next few weeks between now and Cinco de Mayo I’m planning on sharing some unique tequila cocktails as well as some classics – usually on Fridays… I’m just running late this week. One of my military sons was in from Korea for 10 days. It worked out beautifully because one of my OTHER military sons (the one who is with the Thunderbirds) was in Waco, about 90 minutes away, for an air show last weekend. So those two got to see each other which doesn’t happen very often and it was completely unplanned. So much fun while it lasted but it was harder on me since I had to say goodbye twice in a week. I tried to get this written up yesterday but I was too much of a basket case, y’all. I couldn’t even see the computer screen for all the tears. I am so proud of them being willing to serve but it definitely comes with a price. The oldest one is about 7 years away from retirement and I am hoping that he gets an amazing job offer from somewhere right here in Texas – one that he can’t refuse. He’s been in Las Vegas and traveling with the Thunderbirds for several years but in the fall he’s headed to Japan with his wife and baby – and it’s unlikely that I’ll see them again for four years or so. I keep reminding myself that the flight to Japan isn’t THAT long and the Internet has made communication so much easier… but the reality is that it’s not like having them here. Son #2 is actually coming back from Korea and will be up by Sacramento so that will be nice… and son #3 is in Florida when his ship is in port so I do see him more often, too. I’ve told the rest that there is to be NO MORE of this moving away from Mom business. I’ve got one kiddo heading to A&M University in the Fall but that’s only a couple of hours away. Another is heading to TCU for the Spring 2018 semester but that’s in Fort Worth, also not very far. I’m at that time of my life when I am seeing the fruit of my years of parenting but every time someone moves out I go through empty nest … even though my nest is still plenty full. So, let’s chat about this tequila cocktail. I don’t know if you’ve ever had hot pepper jelly but it’s so good that I will happily eat it with a spoon right from the jar if no one is watching. 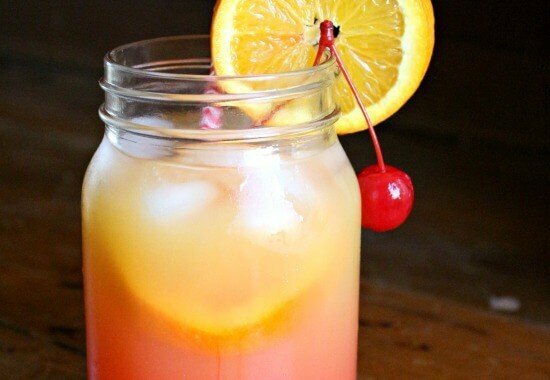 It adds a unique sweet-spicy flavor to this cocktail and takes the place of the simple syrup that’s usually added. I blend it up with just enough ice cubes to dilute it a tiny bit and make it icy cold – you can add club soda if you want to make it lighter and bubbly. It’s great either way! I use silver tequila in this. Silver tequila is sometimes called blanco or white tequila and it’s the clear one. Silver tequila is bottled right after it’s distilled so it’s not aged. It tends to have a harsher taste and it’s usually less expensive, too. While the silver variety would be awful in some cocktails it works perfectly in this tequila cocktail since the jelly and schnapps smooth out any harsh notes. I didn’t like the color when I made it with my reposado tequila and I thought the more delicate flavor got lost in the mix. When this tequila sour cocktail is done there are pieces of hot pepper floating around, suspended in the liquid. I liked the look of this so left them in. If you want a clear cocktail without the pieces of pepper then you can strain the drink through a fine mesh strainer as you’re pouring it into the glass. 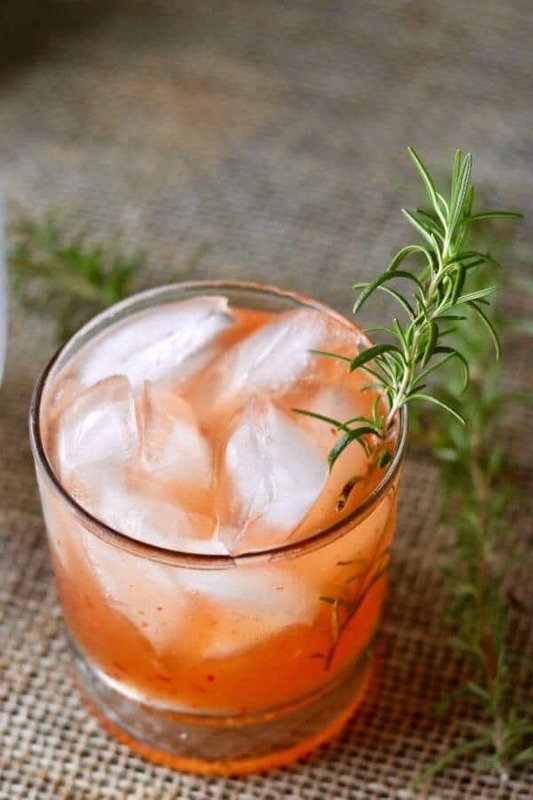 I have rosemary growing in my kitchen garden so it was easy to go snip a little off to stir the cocktail with. I was surprised at how much that little sprig added to the flavor. You should be able to find fresh rosemary in the produce section of the grocery store where they have fresh herbs. I know I’ve seen it at Walmart. Be careful- this one is easy to get lost in. It is very strong despite the taste and I was feeling a little woozy after developing the recipe despite the fact that only sipped on the first few before pouring them out. Drink responsibly, y’all. I don’t want to lose ya! On the rocks glasses are perfect the perfect size for this tequila cocktail. A good spicy pepper jelly is my preference. Different brands have different heat levels. Aromatic Bitters adds a little extra oomph. This one is uniquely spicy. 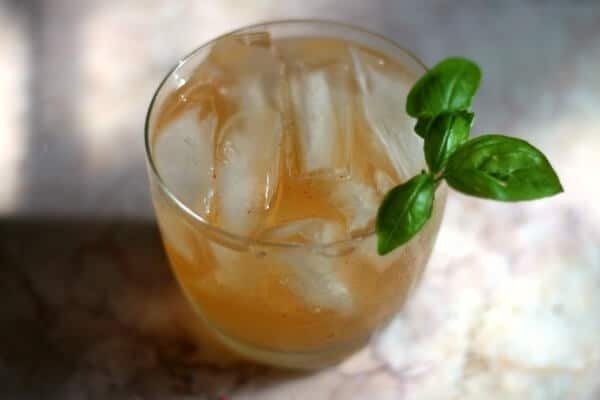 Spicy-sweet, this tequila cocktail is a take on the classic Tequila Sour recipe. Sweet peach flavor is balanced with a tart blast of lime and fiery pepper jelly. Stir with a sprig of rosemary and leave it in for garnish. You can lighten up this cocktail with club soda for a sparkly, refreshing, lighter version.